My motivated critics couldn’t contain their joyful glee this week at discovering my hypothetical support for a Handmaid’s Tale-type patriarchal social structure as (let’s say) hinted at in Nellie Bowles’ New York Times article presenting her take on my ideas. It’s been a truism among anthropologists and biologically-oriented psychologists for decades that all human societies face two primary tasks: regulation of female reproduction (so the babies don’t die, you see) and male aggression (so that everyone doesn’t die). The social enforcement of monogamy happens to be an effective means of addressing both issues, as most societies have come to realize (pair-bonded marriages constituting, as they do, a human universal (see the list of human universals here, derived from Donald Brown’s book by that name). As antiquark2 points out, “for decades.” My critics’ abject ignorance of the relevant literature does not equate to evidence of my totalitarian or misogynist leanings. 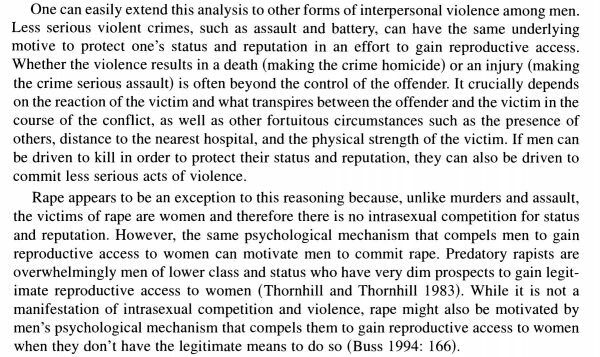 I might also add: anyone serious about decreasing violence against women (or violence in general) might think twice about dismissing the utility of monogamy (and social support for the monogamous tendency) as a means to attain that end. 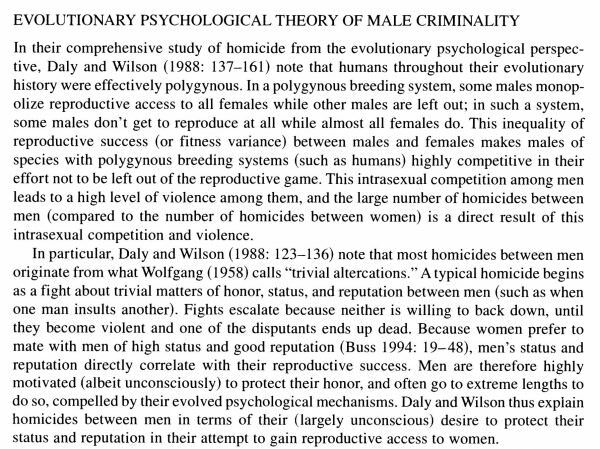 Simply put: monogamous pair bonding makes men less violent. Here are some examples of the well-developed body of basic evolutionary-biological/psychological/anthropological evidence (and theory) supporting that claim. Here’s some relevant sections of the latter paper (pp. 439-440). So, let’s summarize. Men get frustrated when they are not competitive in the sexual marketplace (note: the fact that they DO get frustrated does not mean that they SHOULD get frustrated. Pointing out the existence of something is not the same as justifying its existence). Frustrated men tend to become dangerous, particularly if they are young. The dangerousness of frustrated young men (even if that frustration stems from their own incompetence) has to be regulated socially. The manifold social conventions tilting most societies toward monogamy constitute such regulation. Just the plain, bare, common-sense facts: socially-enforced monogamous conventions decrease male violence. In addition (and not trivially) they also help provide mothers with comparatively reliable male partners, and increase the probability that stable, father-intact homes will exist for children.